Genuine love involves hate. 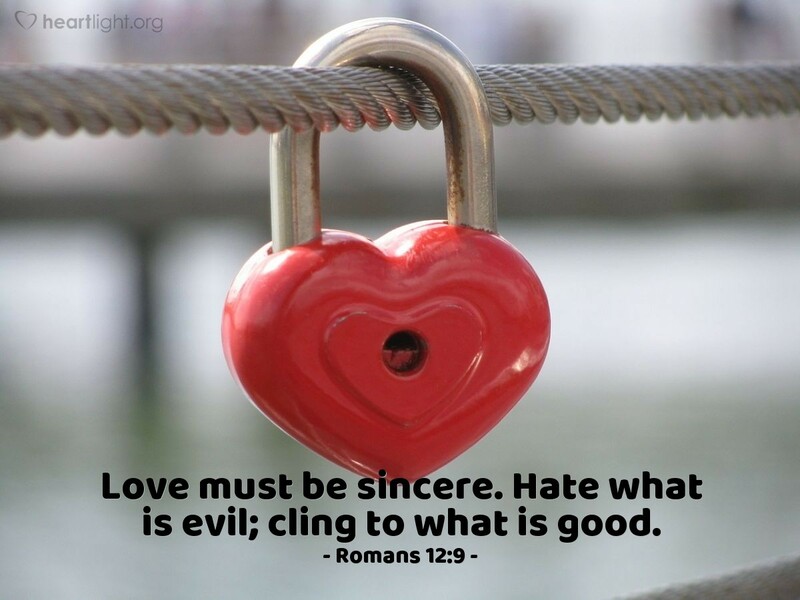 Genuine love means that we hate evil. We detest it creeping into our hearts and ruining our relationships. We abhor its effects on those we love. We are repelled by the eternal destruction it causes in those whose lives are tender, or weak, or wavering. So the very best thing we can do for those we love is to cling to what is good and stay far away from evil and wickedness. Loving Father, may my life be a source of goodness and joy in my family and with my friends. Please give me wisdom to see what is good and the courage to pursue it with passion. Please protect me from the evil one and forgive me when I have followed his temptations. Please protect those I love from the fallout of my own selfish and evil decisions. Please purify and cleanse me so that my life may be lived holy, and wholly, to you. In the name of your Holy Son, Jesus. Amen.